Maura Marden was always a tough athlete. 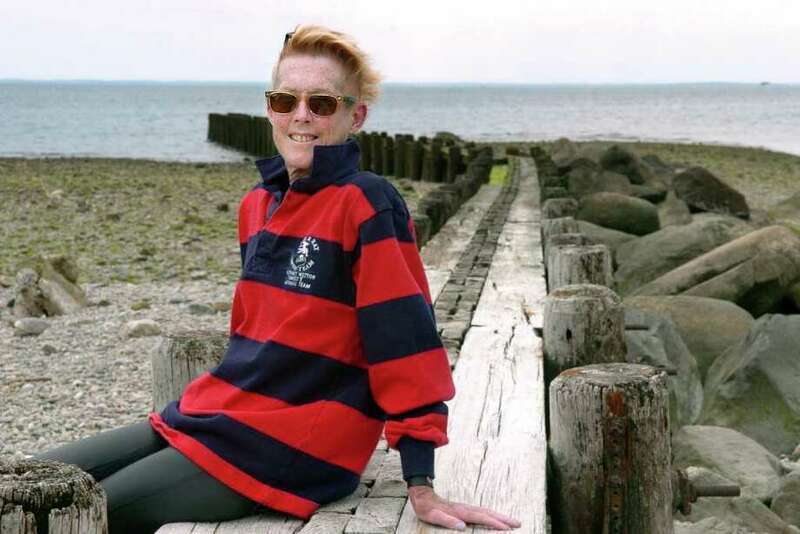 A swimmer and a marathon runner, Marden was used to fighting through pain. But on Aug. 7 her resilience and toughness made a lasting impression on all those at the annual SWIM Across the Sound fundraiser. Despite being in the midst of a battle with cancer, the 53-year-old Marden participated in the swim along with her three sons and family friends. "We thought she would swim for maybe five minutes and that would be enough time in the water for her," said Bill Marden, Maura's husband, who was in the boat beside her. "But she yelled up `give me 10 more.' She was so enthusiastic and she swam for 10 more minutes." Maura Marden died on Monday, ending a four-year battle with cancer. Her family and friends said that final swim with her family meant everything to her. "For two years she never, ever complained," said Bill Marden. "Every morning she was up, she went to the gym, she lived her actual life and didn't let cancer get in the way. Every night she would make dinner." "She was so thrilled when she finished and after the swim she was very sick," Bill Marden said. He added that his wife had been sick in bed until 3 p.m. the day before, but remarkably was healthy enough to participate in the part of the 15-mile swim from Port Jefferson on Long Island to Captain's Cove in Bridgeport that serves as a fundraiser for the St. Vincent's Medical Center of Bridgeport. "I saw her the day before she went into intensive care," said Linda Johnston, a friend of Maura's for 22 years. "And she said, `The greatest moment was the day I swam with the boys.'" Marden swam with her three boys -- David, 23; Danny, 21; and Bart, 19 -- all Division I swimmers at the University of the Pacific in California and graduates of Fairfield Prep, along with family friend Andy Davis and her oncologist, Dr. Neil Fischbach. Bill Marden served as captain for the group, called Team Pride II. In addition to swimming, she also raised more than $20,000. Johnston said Marden "showed an awful lot of strength" during the swim and it was an amazing moment. She said a YouTube video shows Marden crossing the finish. "You can tell she wasn't well at that time, but she had to do it for her kids." "Seeing Maura swim merely confirmed what everyone who has ever come in contact with her already knows, Maura Marden is one tough cookie who loves her family and does everything in her power to help those around her," said a close friend, Bill Loftus. "It was vintage Maura, she gave it everything she had," said Loftus. Marden swam two, twenty minute legs in the race. She also received an award for raising the most money for St. Vincent's Hospital. In her address to the crowd, Loftus said, Marden said that "she is living proof that the St. Vincent's Foundation provides an invaluable service to cancer patients in making their quality of life so much better and she encouraged the crowd to continue supporting this vital organization." Loftus recalled some people questioning Marden's decision to swim while dealing with such a debilitating illness, especially because she was receiving six-hour treatments at Yale-New Haven, including one the day prior to the race. But, he said, "if you knew her, it made perfect sense. She was never happier than when she was at a swimming event with her family, especially one that was so dear to her heart. She used her illness as a platform to do good for others who were not as fortunate as she." It was a selfless act totally consistent with her personality and character," Loftus said. Marden first found out she had breast cancer in 2007 and, by 2008, it was gone, her husband said. Marden thought that was behind her, but in November 2008 she was diagnosed with Acute Myleogenic Leukemia. She was admitted to Yale-New Haven hospital. She endured chemotherapy in 2008 and a bone marrow transplant in 2009, which led to side effects and eventually an infection, said Bill Marden. Through it all, he noted, Maura showed tremendous strength and was always there for her family. "From 2007 she never missed a day in the gym, never missed making dinner, she always put her responsibilities and desires ahead of the illness," he said. Marden was active at Fairfield Prep, swam at the Westport Weston Family Y and was also known in Westport for a run at the second selectman seat with John Izzo in 2001. "She was a beautiful woman. She was energetic, enthusiastic and outgoing," said Pete Wolgast, who was the Republican Town Committee chairman at the time. "She will be missed." Johnston, who met Marden at the Westport Young Women's League, found running to be a common interest. The two worked out together frequently at Fitness Edge. "It was like my Tuesday's With Maura," she said. "She had a great passion for life, was courageous, was a role model and I am lucky to have to got to know her." Loftus, like Johnston, said he was lucky to have known Marden. "As I told my children the other day, we can all learn a lot from the way that Maura lived her life," Loftus said. "I feel blessed to have the honor of calling her my friend and we'll all miss her greatly." In addition to her husband and three sons from her first marriage, Maura Marden is survived by her stepchildren, Billy and Deli; her mother, Margaret P. Finneran; five siblings; and 12 nieces and nephews. A wake will take place Friday from 4 p.m. to 8 p.m. at Spear Miller Funeral Home, 39 South Benson Road, Fairfield. A Mass of Christian Burial will be celebrated at 10 a.m. on Saturday at St. Luke Parish in Westport, 84 Long Lots Road.